On one of the first weekends after my husband and I moved to Madison in late September 2004, we decided to take a break from painting and unpacking to walk into town. What we happened upon was our first introduction to Bottle Hill Day, the annual October festival that takes over the streets of downtown Madison. This day has since become something our family looks forward to every year. 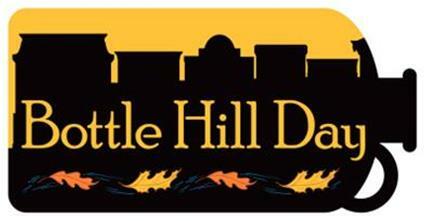 This year, Bottle Hill Day is Saturday, October 7, 2017, from 10am-5pm. The festival is named as a tribute to the village that stood at the crossing of Ridgedale Avenue and Kings Road in the early 1700s. Bottle Hill was renamed Madison in 1834 after President James Madison. Our first year, the Madison Historical Society had a fabulous free trolley that toured passengers around to various Madison historical sites. We traveled along Ridgedale Avenue (near our home) and learned about its history during the Revolutionary War. We also drove by several former locations of Madison's rose greenhouses. It was such an amazing introduction to our new town! Since that first year 13 years ago, we've watched Bottle Hill Day grow from just two blocks along Central Avenue and Waverly Place, to extending down Main Street, along Lincoln Place, and Kings Road. At Central Avenue School, bounce houses and mini rides can entertain kids for hours. There are usually additional kid activities, such as bungee bouncers, on the lawn in front of the Hartley Dodge Building. Four stages are set up at various points in town, including near Nicky's Firehouse Restaurant, Lincoln Place, the Museum of Early Trades and Crafts, and the Hartley Dodge Building. Madison school choruses, bands, and orchestras, in addition to local kid and adult musical groups hold short concerts throughout the day. In the parking lot in front of the Ambulance Corp, the Madison Chamber of Commerce and Madison P.B.A. #92 host their annual car show. Just around the corner from there in front of the train station is the annual Beer Garden. Over 200 vendors set up booths along the streets, selling food and items. Local groups, such as the Boy Scouts, Girl Scouts, and the Madison Area YMCA also have booths, in addition to local campaigning political groups. Bottle Hill Day isn't complete for my family unless we've tested out the remote control robots at the MHS Robotics Club booth, and gotten free squishy stress balls from political candidates! See you next weekend at Bottle Hill Day!